Pack rubber boots and umbrellas for this weekend's roadside sales as people may be in their garages and barns if they're not out on the lawn. Thirty-five years ago this weekend a handful of families in Cornville set up lawn sales in their yards on West Ridge Road. Nothing big — just some tools, books, children’s clothing, maybe a few antiques for sale. Next thing you know other families got into the idea of having yard sales along that route on the last weekend before Memorial Day. The idea spread to a 3-mile-long yard sale. Then it became known as the Six Mile Yard Sale for a few years, where everything was on sale — tractors and farm and gardening equipment and supplies, toys, antiques, tools, military artifacts, books, games, baseball cards, clothing and more. Now the yard sale runs for 10 miles — it’s the Cornville 10 Mile Yard Sale and it’s this weekend, running from Cass’ Corner at the top of West Ridge Road on Route 150 in Cornville, all the way to U.S. Route 2 at the Kennebec River in Skowhegan, with offshoots into the town of Athens. Someone’s junk can be someone else’s treasure. The annual event now draws thousands of people from all over New England and Canada, said event organizer Janet Bernard of Nelson’s Candies on West Ridge Road. One year the event was advertised as part of the “visit New England” promotions on the Boston Red Sox radio network. The hours of the yard sales are from 8 a.m. to 5 p.m. Saturday and Sunday. 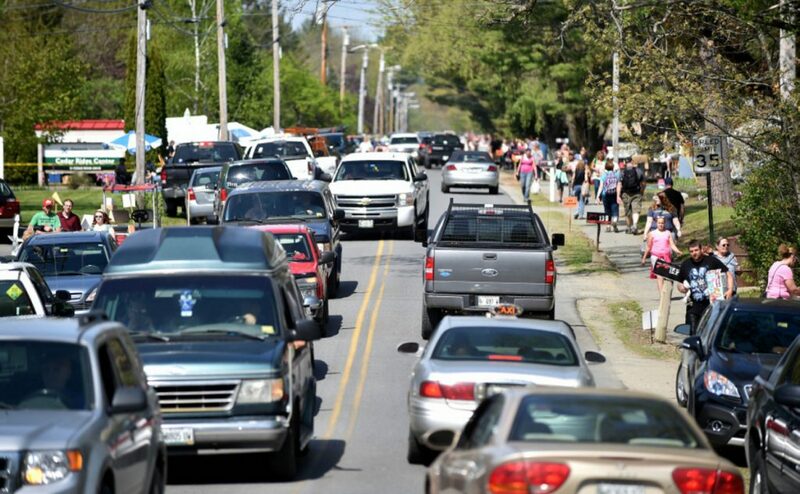 The sales now fill all the side roads off of West Ridge and into Skowhegan where the crowds tend to get pretty thick and parking has presented a safety issue where Malbons Mills Road meets Dr. Mann Road. Much of the way in years past has been a bumper-to-bumber shopping mall. In Skowhegan, Police Chief David Bucknam said he has assigned an officer to patrol the road to keep it open. There also will be a parking ban on the east side of Malbons Mills Road from Route 2 to Prescott Lane in Skowhegan and the north side of Dr. Mann Road from North Avenue to Malbons Mills Road, starting Friday and in effect through Sunday. “That Saturday of the yard sale is the busiest foot traffic day that we have that comes through our shop,” Bernard said Thursday. “It’s one of those things — it’s rain or shine. If it’s raining, people will be in their garages and their barns. If it’s nice, they’ll be out on the lawn. I suggest to people, if you know it’s going to rain, wear your rubber boots and bring your umbrellas.